DONETSK, Ukraine -- Pro-Kremlin rebels in eastern Ukraine are hampering the treatment of a growing number of civilian casualties by threatening doctors, hijacking ambulances and looting medical equipment, Human Rights Watch said Tuesday. Pro-Russian rebels ride on top of an armoured personnel carrier near Donetsk. 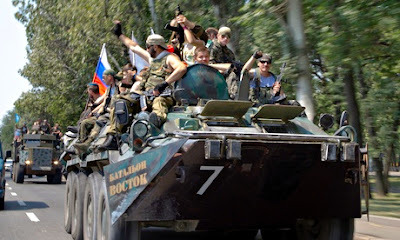 "Pro-Russian insurgents' attacks on medical units and personnel are putting sick and vulnerable people and those who care for them at risk," Yulia Horbunova, Europe and Central Asia researcher at Human Rights Watch (HRW), said in a statement. Ukraine's military top brass have pledged to stamp out the insurgency in the near future, but rebels have hunkered down in major population centres and pledged to fight to the death.